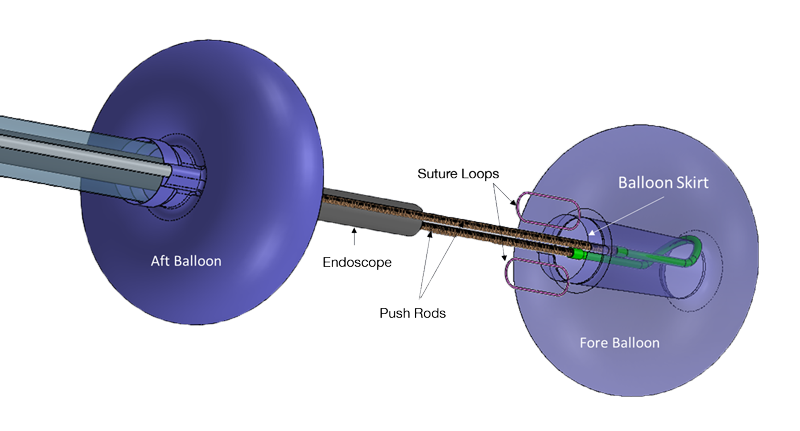 WESTPORT, CONN, NOVEMBER 13, 2018 − Connecticut-based medical device innovator Lumendi, LLC has received U.S. Food and Drug Administration clearance for its DiLumen™ EIP technology with ‘suture loops’ placed in the skirt along the trailing edge of the fore balloon. This new device feature will help facilitate tissue manipulation for easier dissection and resection of polyps without the need for surgical intervention. With working lengths of 103 cm, 130 cm and 168 cm, the DiLumen EIP is unique as it can provide stability and traction in any part of the colon. Lack of proper traction and tissue manipulation has long plagued advanced endoscopists and colorectal surgeons. This modification allows for the suture loops to be attached to the DiLumen’s fore balloon assembly. An endoscopic clip can then be simultaneously attached to the suture and the mucosal edge of a polyp during resection. Because the DiLumen fore balloon can be moved back and forth, doctors can now provide traction to the tissue, which will enhance their ability to lift and dissect and ultimately resect polyps. “This is an important step in Lumendi’s continued dedication to innovate our existing devices that facilitate endolumenal procedures for many gastrointestinal interventions,” said Dr. Peter Johann, CEO of Lumendi, Ltd. “The growing, extensive use of DiLumen validates our goal of shifting the paradigm for colon disease intervention from the traditional surgical approach to a truly minimally invasive one that utilizes novel endolumenal-based technology. This shift will increase safety and patient recovery time as well as significantly reduce costs,” added Dr. Johann. The DiLumen Endolumenal Interventional Platform (EIP) is a non-sterile, single-use, close-fitting sleeve that fits securely over a standard endoscope to stabilize it in the large intestine and facilitates use of the endoscope for optimal visualization, diagnosis, tissue manipulation and treatment. It is the first device from the Endolumenal Interventional Platform based on Lumendi initiative to migrate many gastrointestinal surgeries to endolumenal procedures. Lumendi recently reported more than 500 therapeutic procedures by more than 40 endoscopists and colorectal surgeons have been completed with its DiLumen™ EIP technology, continuing to demonstrate the safety, performance and therapeutic benefits of the DiLumen. These procedures are in addition to those in its first-in-human study completed in October 2017. The DiLumen™ EIP, which received FDA 510(k) clearance to market in December 2016, has been commercially available in the United States since May 2017 and in Europe since July 2018, when it received CE Mark. With recent regulatory approvals in Europe, Lumendi has established distribution in the UK, France and Italy and has conducted successful procedures with clinicians in each country. Additional procedures have been completed in Germany and Spain, and Lumendi is adding distribution in those countries and others. The first procedure with DiLumen in Asia was successfully performed recently at Chinese University of Hong Kong.